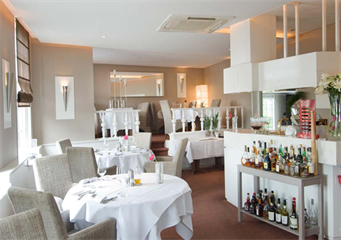 Between the cities of Oudewater and Montfoort – in the former city of Willeskop to be precise – you will find restaurant De Schans. Chef Ries Verburgt understands like no other how to create culinary delights for very reasonable prices. Using mainly local and seasonal products he combines flavors into a sublime composition. This is something that cannot be expressed in words but has to be seen. Best is to come taste and experience it yourselves. De Schans – taxi service! 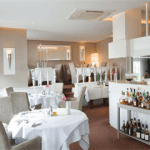 Onder den Peerenboom is located a couple of minutes away from restaurant the Schans. When staying at Onder den Peerenboom there is the possibility for you to be taken to the restaurant and back so you can enjoy the wines as well! We are happy to come back again, Femke is very nice! Hospitable and makes a fantastic breakfast. Thank you so much for a great stay! Love Aad and Charlie. Beautiful apartment and great service! Very beautiful apartments: nicely decorated and a lovely bed. Superb service and very hospitable! Tell me, where does one get home made french bread made out of typical Dutch ‘ sugar bread’? Extensive breakfast and all fresh. So enjoying the morning as well after a good night in a beuatiful place. Recommendable! I have been to Onder den Peerenboom with a group of people twice now. They – and I – were all very enthusiastic about the accommodation, the special food and especially with Femke’s very pleasant approach. Bears repetition and very recommendable! This B&B is everything one can expect from a B&B in a beautiful renovated farm house with outbuildings. We had the warmest reception and were provided with all the tips about the surroundings and restaurants to visit. The various breakfasts, freshly prepared by our hostess were excellent, very thought through and catered. We really enjoyed ourselves and everything possible was done to make us feel at home, and you did! Nothing but good!